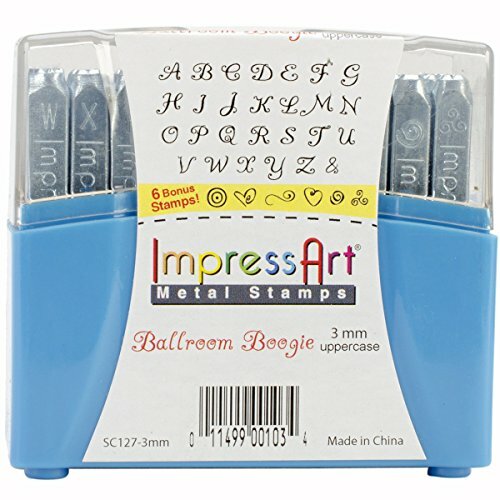 IMPRESS ART-Metal Stamps. Great for jewelry making and mixed media projects. For use with soft metals clay wood leather and other materials. This package contains thirty-three 3mm metal stamps. Design: Ballroom Boogie Uppercase Letters. Imported. Size: 3mm. New oil-free coating to protect against rust. Each stamp labeled on side for easy identification and orientation. Stamps are made of carbon tool steel, hardened to last project after project. Stamp set comes in individual plastic case. If you have any questions about this product by ImpressArt, contact us by completing and submitting the form below. If you are looking for a specif part number, please include it with your message.